CINCINNATI -- Nearly a month after a new transit-oriented traffic rule went into effect on Downtown's Main Street corridor, Cincinnati police have issued some citations, but some bus riders say they aren't catching all the offenders. This makes some worry the initial level of enforcement might not be enough to give the bus lane a real shot at success. "Enforcement is going to be a big deal," said City Councilman P.G. Sittenfeld, who spearheaded efforts at City Hall to test the bus-only lane, during a Nov. 5 ribbon-cutting ceremony for the bus lane . "If someone thinks they can come and park there and run in and get a bagel for 15 minutes, they can't. They're going to get a ticket." The new rule reserves the right-side lane of Main Street for bus traffic between Government Square at Fifth Street and the Hamilton County Courthouse at Central Parkway. The lane becomes bus-only during the morning and evening rush hours, from 7-9 a.m. and 4-6 p.m. Throughout the rest of the day, the lane offers metered parking spaces. 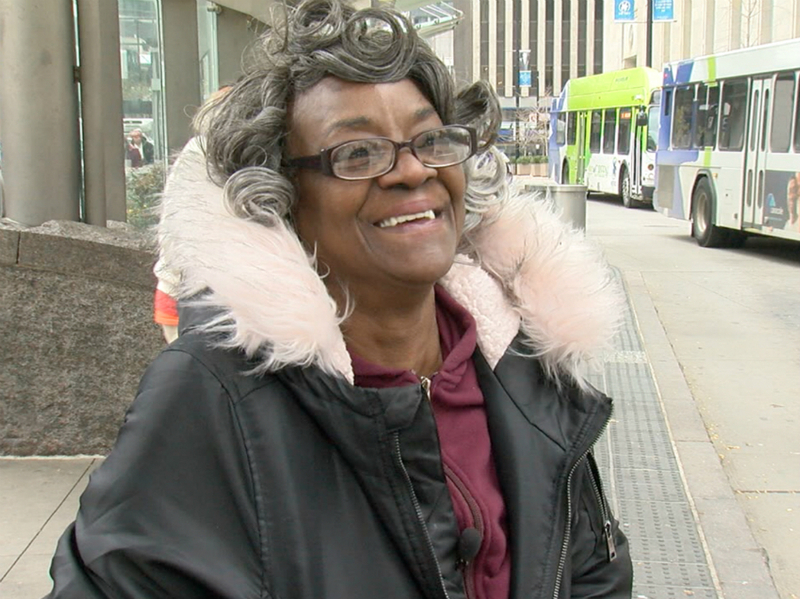 Donna Stewart doesn't own a car and rides Cincinnati Metro every day -- sometimes up to four times a day. She said she was happy to hear the city was going to test the new transit lane along Downtown's often-congested Main Street corridor. "I think it's a good thing," she told WCPO. Stewart, a resident of Avondale, said her bus ride home almost always includes the Main Street stretch before heading up Reading Road. She said the congestion through Downtown hasn't bothered her much in the past, but she knows she is an exception to the norm. "That's because I have patience," she said. When asked if she thinks other bus riders are as patient as she is, she said: "They don't like it. I think it discourages people from catching the bus because they don’t have the patience to sit their butts down and be patient." The Southwest Ohio Regional Transit Authority, which owns and operates Cincinnati Metro, counts roughly 635 buses traveling the corridor each day, with 90 of those buses using Main Street's far-right lane to pick up and drop off passengers. That's why advocates initially pushed for Main Street as the test site for a bus-only lane. Sittenfeld said planners with the Better Bus Coalition -- the nonprofit grassroots group that lobbied for the bus lane -- chose Main Street to test the transit-lane concept Downtown precisely because of its heavy traffic congestion in the mornings and evenings. "I said to the Better Bus Coalition, 'You guys are bringing me a really ambitious place to start this. Isn't there a place with a bit of a lighter touch to start?' They said, 'If you want to have the biggest impact, you have to start it at Government Square,'" he told reporters. That's because Government Square's central Downtown location puts it right in the middle of traffic, and any subsequent delays ripple out throughout the rest of Metro's system. 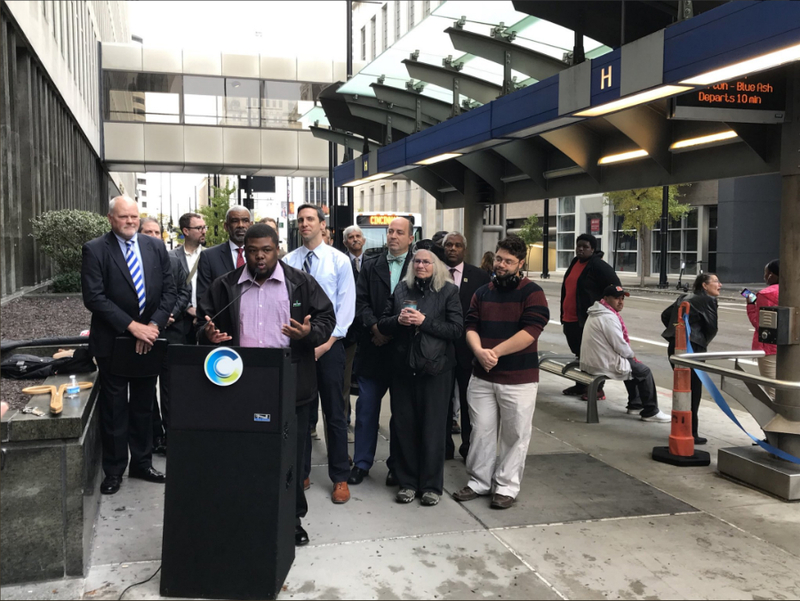 "As a full-time bus rider myself, I can attest to that most of the time that I'm sitting on the bus is Downtown on Main Street," said Better Bus Coalition President Cam Hardy during the Nov. 5 news conference. Hardy said he has seen some enforcement but would like to see more. "I think that it has to be consistent enforcement," he said. According to Cincinnati Police Sgt. Eric Franz, police issued three citations to drivers in the bus lane during the restricted hours over three separate days during the bus lane's first week. Officers issued another three citations for cars parked in front of a Main Street bus stop on Nov. 10. WCPO requested data on citations issued after Nov. 10, but it was not immediately available. It is common for drivers to be granted a grace period when some new rules go into effect, but the few citations issued during the bus lane's first days suggest that is not the case here. Even if there were a grace period, Hardy said he wouldn't support it. "I think we need to be ticketing immediately," he said. "People need to understand that you can't park there. Times are changing down here; things are changing." Writing tickets isn't enough, Hardy continued, and police need to be visible in the area while the rule is in effect. "People need to know that you can’t idle there, you can’t sit there, you can’t drop people off there. You’ve got to keep it moving," he said. "You’ve got to see police there, or, you know, some sort of enforcement there all the time." WCPO asked police how many officers it devotes to patrolling the area during the restricted hours. Traffic Unit Commander Lt. Brian Norris said the city's Parking Enforcement office -- with assistance from CPD's Central Business Section -- was in charge of enforcing the new rule. Meanwhile, Hardy and Stewart both agree: They hope to see more bus-only lanes pop up around the city in the future. "Reading Road -- like the 43, Woodlawn, Evendale, Winton Terrace -- they need a lane for that bus to go straight out Reading Road," Stewart said. Hardy said more bus lanes in the future will require strict enforcement, though. "We want to have an argument to roll out more, and if the bus lane here is not being enforced, we're not going to be able to convince members of Council to support more," he said. Hardy hopes the Better Bus Coalition will propose another bus-only lane test location as early as next month.